Valentine&apos;s Day is sneaking up, and Austin has so many ways to celebrate, whether you have a special someone or choose to honor the day in your own fabulously independent way. Austin has more than 30 wineries within a short drive, making it the perfect place to spend a romantic weekend sipping wines and soaking in gorgeous views. Check out Becker Vineyards for daily tastings of Bordeaux, Viognier and other Rhone-style wines; or head to Flat Creek Estate Vineyard & Winery, which sits on 12 acres of Italian varietal vineyards and offers overnight accommodations for visitors. You can also sip on wines at the picturesque Spicewood Vineyards, or taste French-style Texas wines at Grape Creek Vineyard. Take that special someone out for an elegant dining experience at Green Pastures, an Austin tradition for more than 60 years. This beautiful Victorian home is a wonderful place to enjoy gourmet food, fine wine and true Southern hospitality. The Oasis atop Lake Travis is known as one of the best places in Austin to watch the sunset. Take in the breathtaking views over the water while tasting some delicious, unique dishes. It is certainly one of the most romantic places to go for Valentine&apos;s Day. If you are planning a romantic weekend away, why not check out some of Austin&apos;s world-class hotels and resorts. Spend an evening at the legendary Driskill, a luxurious, historic hotel located in the heart of the city. This immaculate hotel offers the finest in service and amenities, as well as one of the best hotel restaurants in the country, The Driskill Grill, where you can have a decadent, romantic meal for two. Lakeway Resort and Spa offers two different romance packages. The Love on the Lake Package includes a complimentary breakfast by the lake, a two-hour sunset sail cruise and picnic under the stars, complete with wine, cheese and fruit. The Lakeway Romance Package includes champagne, chocolate-covered strawberries and complimentary breakfast in bed or at the hotel restaurant. Looking for a less whimsical, yet still glamorous way to celebrate Valentine&apos;s Day? Austin has you covered. No one to share your love with this year? Come share it with hundreds at Gibson Bar, where everyone celebrates their single status. The bar&apos;s 4th annual Home Wreckers & Heartbreakers Ball features chocolates, flowers, special Valentine&apos;s Day bingo and a heart to punch. A DJ spins music all night long, so you can dance away the loneliness with all your new friends. What better way to celebrate Valentine&apos;s Day than by belting out both pro- and anti-love power ballads? 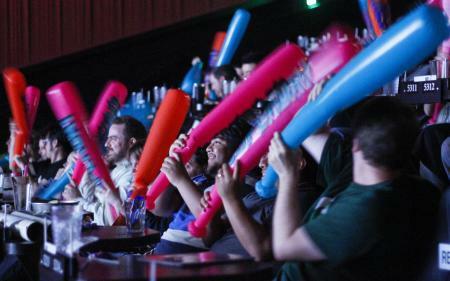 You can do just that at Alamo Drafthouse&apos;s "Love Bites" Sing Along shows, where crowds of people gather during the month of February to hold lighters in the air and defy the traditions of Valentine&apos;s Day.